With 40% of Google Maps usage on mobile devices, we want you to have a consistent Google Maps experience wherever you use it. 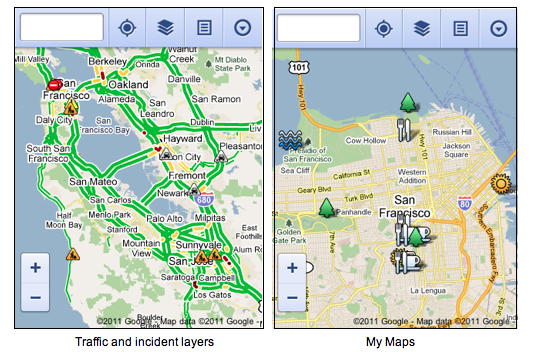 So, today we’re announcing our updated Google Maps experience for mobile browsers on Android and iOS. This past weekend, I was at a team off-site at a ropes course and needed to find a good deli spot to grab lunch. I opened Google Maps on my mobile browser and searched to locate a popular deli nearby. A few finger taps later, I had viewed photos and reviews on the deli’s Place page and found the quickest way to get there using driving directions- all from my mobile browser. 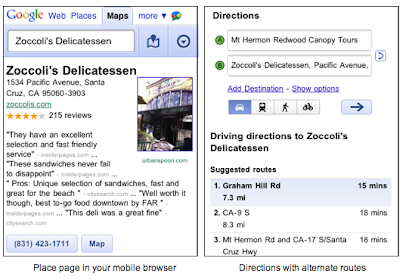 Google Maps for mobile browsers is platform independent - you will always get a consistent experience and the latest features without needing to install any updates, no matter what phone you use. To get started exploring Google Maps in your mobile browser, go to http://maps.google.com or any domain where Google Maps is available. Learn more in our help center. Please add ability to print, just like Gmail can! Any chance this will become vector/svg-based in the future? doesnt development already add the maps jar? When can I send to my car? Google Maps blows away the interface to my GPS, and really would like to send the information to my car the same way I can from the desktop version of Google Maps. Any chance we will see this on Blackberry as well? How long before a full roll-out? Will this be effective on all iOS's including 3.1? "This past weekend, I was at a team off-site at a ropes course and needed to find a good deli spot to grab lunch. I opened Google Maps on my mobile browser and..."
Wow, this doesn't pass the smell test in so many ways. 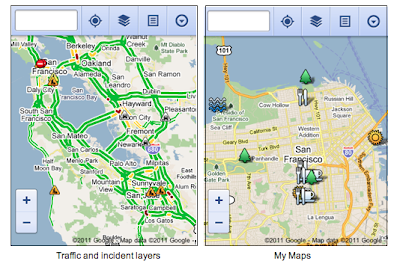 Why in the world would you use Google Maps via the browser when you've got an awesome Maps app on your Android? Why are you looking for a deli to grab lunch when you're at an off-site? And really? Google forces you to go to off-sites on the weekend for team building? Oh, and it's a little weird that the directions show you originating from Mt Hermon Redwood Canopy Tours instead of "My Location." Anyway, yeah, I get it. You're trying to make it feel personal and real by making up a story about how you used your own product to do something useful, but when it's so obviously made up, it's super-distracting. Why is there NEVER any love for BlackBerry OS??? 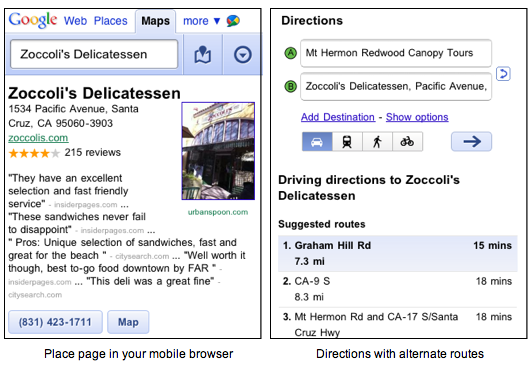 We're still waiting for Google Maps Navigation on iOS. Hurry up before you lose out to Bing who is working on bring 3D Maps Navigation to iPhone/iPad users in the very near future on the Bing app. Looks like Bing appreciates iPhone customers more than Google! When will this integrate with latitude? Bicycle routing is working. Wish that was on the Maps app. It doesn't really work on Android 1.6 with Opera Mini Browser. Google gave iPhone users a slap in the face with this worthless web app. I can’t understand why they have been silent on updating the native Maps app on iPhone and give us Navigation. The native app is stone-age compared to what’s out there. I hope Apple cuts their dependence on Google Maps soon because I think Google is getting a kick out of iPhone user’s frustration and hope that they will switch to Android. You know what? Screw you Google!!! webOS has a webkit browser. Y U NO ENABLE NICE MAPS ON WEBOS??? Google Maps is really very usefull. My Palm Pre Plus comes with Google Maps embedded in the ROM. Because of that, I cannot access Google Maps through the web browser(it redirects my attempts to the embedded version), so how do I access the new Mobile interface for Maps? better yet, will there be an upgrade to the ROM version?